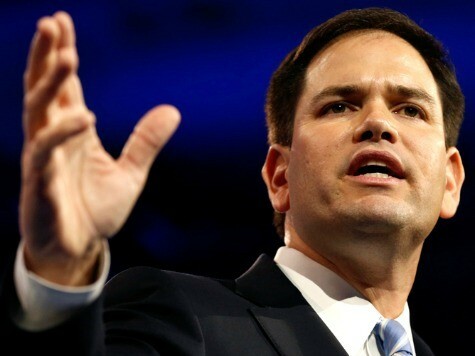 On Wednesday morning, Sen. Marco Rubio (R-FL) is testifying before the House Committee on Oversight and Government Reform on the risk of an Obamacare bailout. Rubio’s office provided Breitbart News, exclusively, with a full copy of his testimony before the 9:30 a.m. hearing, in which Rubio makes the case that the low Obamacare enrollment among young people presents a high risk of an Obamacare bailout. Thank you, Chairman Issa and Ranking Member Cummings for holding this hearing. The focus of my remarks this morning is on Section 1342 of ObamaCare which I, in partnership with your colleague, Tim Griffin of Arkansas, have introduced legislation to repeal. Section 1342 deals with risk corridors. Under normal circumstances, risk corridors provide insurers insurance against unanticipated major losses caused by anomalies in a competitive insurance market. This prevents disruptions in services for patients and customers. And if they are budget-neutral, they can actually protect taxpayers from assuming too much risk. The problem with a risk corridor in ObamaCare is that it is not a normal circumstance. Its failures are not anomalies; they are across-the-board. One or two companies are not miscalculating on ObamaCare’s long-term prospects; the entire industry is being affected by its failures. And it is not a competitive insurance market; it has become a high risk pool. The risk of a bailout was always high. As many of us predicted, these exchanges have not attracted enough young and healthy people to sign up. But the chances of a bailout have significantly increased in the last few months, due to several actions by President Obama and his Administration. That same day, the Department of Health and Human Services issued a press release to go with the President’s speech. They added a critical detail that was missing in the President’s remarks. What this means is pretty straightforward: the rates being charged by the insurance companies were based on young and healthy people signing up. But because that isn’t happening, companies in the exchanges will not be able to offset the costs of insuring older and less healthy individuals. And as a result, the risk corridor will be needed to bailout the companies for their losses. The administration and the law’s supporters deny that this is where we are headed. But proof already exists that a bailout will be required. So health insurers are leveling with their shareholders about how ObamaCare’s failures affect their bottom lines. Credit rating agencies are leveling with investors about how ObamaCare’s failures affect the health industry’s future. Now it is time for President Obama, Secretary Kathleen Sebelius and ObamaCare’s supporters to level with taxpayers about the fact their hard earned tax dollars will soon be needed to bail out ObamaCare. The supporters of ObamaCare have defended the risk corridors by citing how it has worked for Medicare Part D. But these are two fundamentally different programs. Medicare Part D deals with a defined, limited and predictable population of seniors. Insurers knew who was going to sign up and how much they cost to insure. So they could easily price for it. But ObamaCare exchanges deal with an open-ended, broad and unpredictable population of enrollees. No one knew who was going to sign up, how many would sign up and how much they would cost. But what they are now finding out is that the pool of enrollees is smaller, older and sicker than what they priced for. And soon, they will be coming to Washington for their bailout to cover their losses. This law has a host of other serious problems. For example, just yesterday, the Congressional Budget Office concluded that ObamaCare will cost millions of Americans their jobs and add trillions in additional deficits. That is why a growing number of Americans now realize this law has so many flaws that it cannot be fixed. I know that there are still some who hold out hope that ObamaCare will work. Just like there were some in Denver this Sunday still holding out hope that the Broncos could come back and win in the fourth quarter. But no matter how you feel about the law, we should all be able to agree that the American people should not have to pay for another taxpayer-funded bailout. Those who refuse to take that possibility off the table are basically telling the American people that they are so devoted to protecting ObamaCare, that they don’t care how much it costs taxpayers. It is not right to allow a powerful industry to use its influence here in Washington to protect itself from ObamaCare. And it is not right that hard working Americans are forced to pay for it.